Stem cell researchers at Harvard Medical School and Boston Children's Hospital have, for the first time, profiled a highly elusive kind of stem cell in the early embryo—a cell so fleeting that it makes its entrance and exit within a 12-hour span. They described this "poised pluripotent" cell in the journal Cell Stem Cell on June 1. "People have had a hard time capturing the peri-implantation period because it's really hard to define," said Richard Gregory, professor of biological chemistry and molecular pharmacology at HMS and professor of pediatrics at Boston Children's, who led the research. "It's a very dynamic stage. Everything happens within a few hours, which is quite remarkable considering the extent of the changes occurring in the properties of the cells." The stem cell field has done a thorough job characterizing the cells that appear just before embryo implantation: embryonic stem cells. These iconic cells appear 3.5 to 4.5 days after conception, in the so-called blastocyst stage. They are considered to be in a "naïve pluripotent state." Put in a dish, they continually replicate themselves, and with chemical and genetic coaxing they can make an entire mouse. Also quite well characterized are the "primed pluripotent" cells that emerge a day later, just after embryo implantation. Appearing 5.5 days after conception, they look a lot like their naïve forerunners, but their internal signaling is already shifting toward formation of tissues. But until now, no one knew what happened in the time in between. All the embryologic models show a gap. A team led by Gregory and first author Peng Du, a research fellow at HMS and Boston Children's, tracked early mouse embryonic cells as they grew in a dish. At each stage, they purified and sequenced the RNAs produced—an indication of what genes are turned on, or expressed, and what proteins the cell is making. They also looked at microRNAs, tiny bits of code that can regulate multiple genes at once. The expression pattern of one gene, ISY1, caught their attention. "ISY1 goes up quite abruptly in a six-hour window," says Du. ISY1 was found to be a master regulator. When it was turned on, multiple microRNAs also turned on. These, in turn, quickly pushed gene expression to a different pattern, moving the embryo from the naïve to the poised stage. Du and Gregory note that microRNAs are very fast and efficient regulators, silencing certain genes while allowing others to assert themselves. This enables the embryo to transition quickly to a new phase. Genes whose expression changes during the poised phase include those involved in reorganizing the extracellular matrix—the exterior scaffolding that supports and segregates cells—and genes involved in cell metabolism. "Cell signaling might change in preparation for implantation," said Du. When the ISY1 gene was artificially turned off, or microRNAs eliminated, cells remained in the naïve state. Conversely, Du could push cells into the poised state by turning ISY1 on and keep them there simply by keeping ISY1 turned on. Gregory and Du think their work fills a gap in our understanding of stem cells, which could be helpful in regenerative medicine. The cell most often used in research is the induced pluripotent stem cell, which can also be used to create specific cells for clinical use. 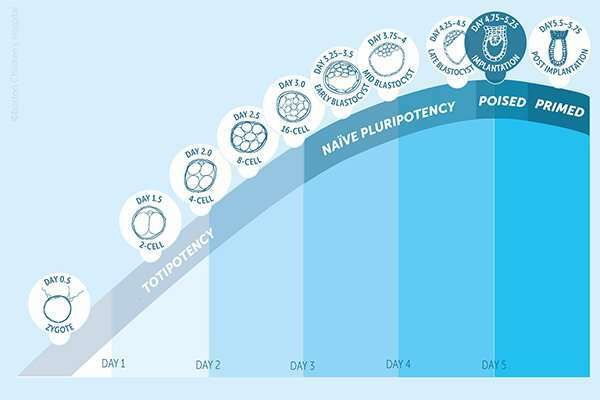 Typically made from skin cells that are pushed to pluripotency through genetic manipulation, human iPS cells are thought to represent a "primed" pluripotent state. "People are trying to make these cells more naïve," said Gregory. "Maybe, through ISY1, we can get human iPS cells that are more efficient at differentiating or be able to propagate them better. It might be that we don't need to make cells truly like naïve—the poised state may be good enough." On a more practical level, the findings might inform research on infertility, perhaps providing clues to early pregnancy failures in which the embryo cannot implant. Gregory and Du are also interested in potential implications for cancer. Cancer cells need to implant into tissues in order to metastasize, and there is evidence that cancer cells and stem cells share many of the same genes.